1. Grease a small (6x6 or 8x8 inch) pan with non-stick spray or oil and set aside. 2. In a small, heavy-bottomed saucepan place gelatin and grape juice. Stir to combine. Set aside. 3. In a separate small, heavy-bottomed saucepan combine sugar and water. Stir over medium-high heat until the sugar is dissolved. Bring to a boil, and boil until temperature on a candy thermometer reads 300 degrees F, about 10 minutes. 4. Remove from heat and add to the gelatin mixture immediately. Place the gelatin saucepan over low heat and stir until the gelatin is dissolved and mixture is liquidized. 5. Pour into the prepared pan and let rest at room temperature until cool and solid, at least 3 hours. 6. Once cool, cut into 1-inch cubes. Or use cookie cutters to make shapes. 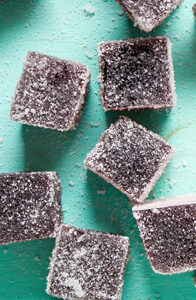 Let cubes dry out at room temperature, then roll in remaining sugar. Let stand at room temperature at least 24 hours to crystalize. Leftovers can be stored at room temperature in an airtight container for up to 3 days.